I completed one commission from last round, but the other three people who ordered commissions never messaged me back when I asked for specifics, so I'm considering those commissions cancelled for the time being. For now, there's just one icon commission open. I can make it a Christmas icon if you want. ^^ This is first come first serve (unless there's something in the first request that I just can't do), so don't feel bad if you don't get picked. Please use the form below to request your commission. Icon: 20 Points for one character and an abstract background. Well. At last. After almost a year and a half of working on this, I can finally unveil my completed project - a Tallstar and Jake PMV. You can find the PMV posted HERE. I talk more about the project itself in the description of the video, but I’m just so happy to have brought this one to completion and I’m really proud of the final product. Also, huge thanks to for helping with advise on this project. This is Rootpaw of SkyClan. The only description we have of Rootpaw so far is that he's a yellow tom (now with blue eyes). That's the same description as his dad, so I decided to try and make his phyiscal build more like his mom's to add some variety. He's a shorthair like Violetshine, rather than having long fur like his dad, and he's on the lither side like her, though of course all of this is subject to change if more of Rootpaw's description is given in the text, this is just what I'm going with for now based on what we have to work with. Before, I designed him as a broken mackeral tabby like his dad. Now, however, with his canon blue eyes, I decided a lynx point tabby pattern would help make those blue eyes look a little less out of place. He's still got the same stripe markings as before, but now with different colors, similar to Tree's but with more of them, to fit the pointed tabby pattern. Overall, I'm really happy with how this turned out. He doesn't look almost identical to his dad anymore, and while I liked the other design I came up with for him, I honestly love how the point pattern looks together with those blue eyes, and I love his new colors and how his pattern looks overall. This is Shadowpaw of ShadowClan. Well, this is a bit of change from the last time I drew Shadowpaw's design. ^^ Before, I made his pattern very similar to his father's (old) design, and I gave him blue eyes since he didn't have a confirmed eye color. But now that he's older and has a bit more of a description in the text, and now that my design for his father has changed, and since he's one of the POV characters in the new book, I figured it was time to make a new design for Shadowpaw. So here he is. He's an apprentice in LS, but it's made clear that he's an adult cat and a full warrior age, so he's drawn as an adult cat here. On his wiki page, Shadowpaw is not given any description of his build, so I decided to come up with my own for him. Both of his sisters are described as looking a lot like their dad, so I'm gonna design them as both being huge, muscular floofs like Tigerstar, but Shadowpaw here has more of his mom in him so he's a bit smaller. He's about average size and build for a tom, maybe a smidge on the small size, and overall has a bit of a fluffy, rounded look to him. He has Dovewing's thick, floofy pelt, with his cheek fur tufting out like hers and her thick, plumy tail. No scars for him, since he's a medicine cat. For his pattern, he's described as a dark gray tabby tom with wide, dark stripes along his flank and the same amber eyes as Rowanclaw. I pulled from a lot of his family members to create his pattern. His cheek stripes are reminiscent of Brokenstar (since canon!Rownaclaw is related to him through Scorchwind), and since I didn't design Rowanclaw with amber eyes like he has in canon, I decided that canon Rowanclaw has Brokenstar's shade of amber eyes, so that's what I gave Shadowpaw. His classic tabby pattern comes from grandpa Rowanclaw, since he's already described to have his eyes, I thought it would nice for him to have his tabby pattern as well. It also made the whole "wide stripes" thing on his flank make more sense, since classic tabby patterns can be thicker in some areas than others. 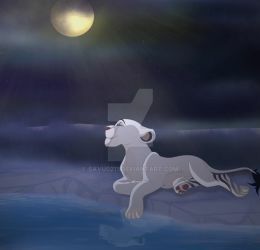 He has a good bit of his mom in his design as well, mostly in the dark fade striping on his forehead and down his back, and how the pale fur on his chest isn't connected to his belly fur coloration. And finally, his forehead upside down V markings come from his dad. I had a lot of fun coming up with his pattern, and trying to make little nods to each of his relatives in that design, while still making him his own unique cat. I think I succeeded. ^^ For his colors, they're all darker shades of his mom's colors, other than his eyes as previously discussed. 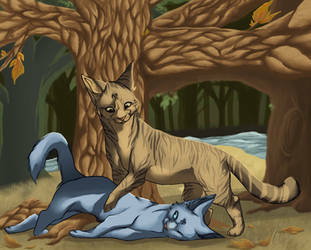 This is Bristlefrost of ThunderClan. Well, Lost Stars came out today, and I've been wanting to draw Bristlefrost ever since I heard her name, so I figured now was as good a time as any. Really I was waiting to see if Lost Stars contradicted my mental image of her, but it didn't, so here we go. Have I said I love her name yet? Because I seriously love her name. Obviously I'm a sucker for any name with -frost in it, but it's just such a pretty name. Anyway. On her wiki page, Bristlefrost is described as a thick-furred she-cat. There isn't much about her build yet, so I decided to go with my own idea with how she looks. She's tall and lithe like her mom, and decently muscled like Ivypool, but with longer fur inherited from Fernsong. But while Fernsong's fur is silky and smooth and neat, Bristlefrost's is all spiky and messy, which is my headcanon for how she got her prefix. ^^ No scars, because the Clans seem to have been at peace since Darktail died (unless Squirrelflight's Hope reveals otherwise) so there's been no battles for her to earn any scars in. This is Dovewing of ThunderClan. Dovewing isn't given any description of her build on her wiki page, but I gave her basically the same build as last time, just with better anatomy. She's depicted here as a small (but not tiny), soft, fluffy medium-furred she-cat. She's got some scars, since she's been a warrior for a while. The big scar on her neck is the one that nearly killed her in Waning Moon. For her pattern, Dovewing is described as a pale gray she-cat. Her canon eye color is green, but as I've said before, I will forever picture her with golden eyes even though there is very little canonical backing for it. I think she was mentioned with golden eyes once or twice when she was first introduced, and even though she was never described that way again, I could never picture her with any other eye color. So in my fan 'verse, she gets to have golden eyes. I was going to keep the pattern the same as on her last ref sheet, but I just wasn't liking how it was looking with this new lineart. So I added a dark fade to her back, tail, and head. I really like how it looks on her, she's still a pretty plain gray cat but it just adds a bit of depth to her design, if that makes sense. I also added darker marks above her eyes, and broke up the pale fur on her chest and belly. Overall, I'm really happy with how this turned out. Jayie-The-Hufflepuff has started a donation pool! Cartoon Style: 30 Points for one character and a background. Additional 5 Points for an additional character. Realistic Style: 50 Points for one character and a background. Additional 10 Points for an additional character. At this time, I am only accepting Point Commissions. I will only accept requests and art trades when I feel like them. If I still owe you part of an art trade, please, please feel free to remind me. I will not mind at all, and I really do need reminders, my memory is horrible. I am still writing my "Echoes of the War" Warriors fan series. All other fanfics are on hold. I am a figure skater, and I have been for the last eleven years or so. I also horse-back ride, but ice skating is definitely a bigger part of my life. I love to read and write stories. Some of my favorite books are from the Warriors series, Les Miserables, and especially Inkheart. I am a Whovian, Sherlockian, and Supernatural Fan, and a fan of Firefly, Castle, and Agents of Shield, and so much more. I also like the movies/musicals Phantom of the Opera, Wicked, Sweeney Todd, Lion King, Aida, and Les Miserables. I like getting critiqued; we can only learn through our mistakes if we know about them. Hey Jayie! It's Sparktooth from BlogClan! Hello! How is the Warrior Cats discord server? I haven't been on because for some reason discord will not work for me. Sorry, I don’t know when that will be.